We’ve all heard them: word trios that drop on our heads like clusters of miniature anvils. 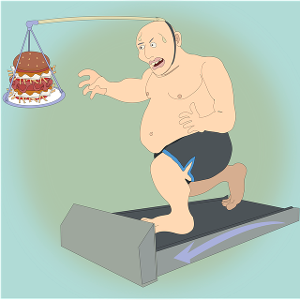 “Lifetime Fitness Awareness is required for everybody,” my college adviser insisted. She gave me a sympathetic look, but said nothing. At the first session, I felt encouraged. Our instructor, a Nice Young Man (over-50 translation for hunk), prayed at the beginning of class for health and well-being. A Christian college has its advantages; I could use Divine help, especially since one glance told me I was at least 10 years older than any of my co-sufferers. He prayed, his voice full of compassion. 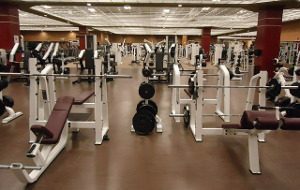 Weight rooms exist for football players. Olympic medalists. Japanese wrestlers in loincloths. I don’t even like to swimsuit shop. As we filed into the weight room, young men with biceps the size of hams gave us polite smiles as each hoisted half a house above his head. I stared at a machine. It smirked back. Deep in its shiny metal innards, it knew the truth: to me, heaven presents no mystery, compared to the incomprehensible operation of any and all machines. I refused to be defeated by a lower species. I grasped the machine’s cold, skeletal limbs and yanked them toward my chest. The machine fought back, but with grim determination, I conquered my opponent. I had nearly completed a whole set when the instructor interrupted me. Would I please stop wrestling with the equipment rack? What exercise horror stories are you trying to forget? This entry was posted in Coffee Corner and tagged Exercise, Exercise machines, Fitness, Humor, Older adults, Rachael O. Phillips, Senior exercise on February 1, 2017 by rachael. All of them. I’m trying to forget all of them. But I distinctly remember the one when I flew off a pilates ball and hit my head on an iron bar. Is it bad when you bounce further more times than the ball? Ouch-ouch-ouch, Karla! And we do this for our HEALTH? I’ve used my most recent deadline to totally ignore any semblance of exercise, rather than walking to the coffee pot. But I sent the ms. yesterday, so now, I may have to walk around the block. Argh!